As new lamp technologies become viable for more applications, manufacturers must design for the many facets of general illumination that the consumer takes for granted, like dimming with standard wall dimmers. LEDs are intrinsically dimmable light sources and are commonly marketed as such; however, that does not mean that all integrated LED lighting products, particularly replacement lamps for incandescent lighting, are dimmable, or that residential dimmable LED products provide the same end-user experience when coupled with the existing installed base of triac dimmers. Thus, dimming has been often discussed as one feature that needs to work well for solid-state lighting to achieve widespread adoption in general lighting applications, including residential uses. One requirement for LED replacement lamps entering the residential lighting marketplace is compatibility with dimmers designed for incandescent lamps. The task of designing LED replacement lamps compatible with common residential dimmers is complicated by the fact that dimmers may vary considerably in performance, even with the same incandescent lamp. This presents difficulties for manufacturers attempting to design replacement lamps compatible with a wide range of dimmers. To understand the performance of some currently available lamps, the LRC conducted technology evaluations of six CFL and six LED lamps, each with five different commercially available dimmers, for a total of 60 combinations. The lamps were evaluated based on existing standards for many different parameters, including minimum and maximum light level, dead travel, flicker, and current and voltage levels. The three key trouble spots for compatibility were minimum light level, dead travel, and flicker. For minimum light level, 43% of CFL/dimmer combinations and 53% of LED/dimmer combinations were able to meet the minimum light level requirements stated by NEMA SSL-6. When examining dead travel in relation to dimmer travel (i.e., the travel position of the mechanical actuator of the dimmer), the data show that 63% of working lamp/dimmer combinations had dead travel of less than 20% of the total dimmer travel. For directly perceivable flicker (when lamps were dimmed), 36% of CFL/dimmer combinations and 44% of LED/dimmer combinations were characterized as having no perceptible flicker. While the technology evaluations showed the extent of lamp/dimmer compatibility issues, the LRC wanted to look more closely at users' expectations for lamp dimming. 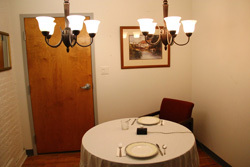 A laboratory "dining room" was set up for experiments investigating users' perceptions of minimum light level, dimming profile (i.e., dimming curve, monotonic dimming, and dead travel), and flicker. The laboratory "dining room" used for human factors experiments in lamp dimming. Subjects were asked to dim the light from maximum to a minimum acceptable level: first, for a reading task of high contrast, 12-point font size simulating a menu in a restaurant; and second, for a leisurely ambiance setting for casual conversation. In both cases, the subjects dimmed the light in the room to approximately 14 lx measured horizontally on the dining table, independently of the initial light level, which ranged from 100 lx to 240 lx. These results indicate that defining the minimum light level as a percentage of the maximum light output from the lamp or luminaire can be problematic when multiple sources are in the space (i.e., to get the same light level by dimming one lamp to 10% would require dimming two lamps down to 5%, etc.). Therefore, any benchmark for a relative minimum dimming level in percent from maximum will not satisfy all end users until such a time when lighting products can reliably dim to nearly 0%. Subjects were given a generic dimmer that could be used to dim the light above the table. The experimenter loaded each of a set of five dimming curves into the dimmer (a high and a low S-curve, linear curve, square law curve, and inverse square law curve), one dimming curve at a time in a random order. Once the dimming curve was loaded into the computer program, the light was automatically turned on to full output (100%) and left for 1 minute so the subject could adapt to the maximum light output setting. Subjects were instructed to use the dimmer to dim the light between maximum and minimum until they had decided how acceptable they found the curve. Subjects were then asked to rate the dimming curve using a scale from –5 (Very Unacceptable) to 5 (Very Acceptable). Finally, subjects were asked to decide whether they would buy the lamp/dimmer combination they had just evaluated for their home. The results of this experiment show that the two curves that received the lowest ratings (the two S-curves) had either a high minimum light level or perceptible dead travel. Of the other three curves examined (linear curve, square law curve, and inverse square law curve), the square law curve and inverse square law curve were rated as being highly acceptable by subjects. The low ratings given to the high and low S-curves appeared to be most related to dead travel and minimum light level. The high S-curve appeared to receive the worst ratings of all other tested curves because it suffers from both a high minimum light level and a long period of dead travel at the top of the curve. The low S-curve also received lower ratings due to the shallow slope at the top of the curve, which would appear to the viewer to be dead travel. These data begin to suggest that most dimming curves, having a low minimum light level and being reasonably free of dead travel, are potentially acceptable to the end user. These artifacts of the dimming curve seem to have the most bearing on an end user’s dissatisfaction of the dimming experience. Past research conducted by ASSIST and the LRC demonstrated that when LED light sources flicker at frequencies of at least 100 Hz, direct perception of flicker is neither visible nor objectionable, but stroboscopic effects can be detected indirectly even at frequencies of 300 Hz. Mitigation of stroboscopic effects can be accomplished through decreasing modulation depth, by ensuring that light sources do not switch entirely off when they flicker. Avoiding low duty cycles near 10% may help prevent visual discomfort. However, more than 10% flicker below 100 Hz could be noticeable and unacceptable to end users. For frequencies equal to or above 100 Hz, ASSIST recommends a calculation method to quantify the predicted acceptability of noticeable stroboscopic effects from a light source based on the percent flicker and the frequency (ASSIST 2012). The same equations can be used to determine either the maximum percent flicker, or the minimum frequency, needed to minimize the detection of stroboscopic effects for a given reference criterion. Following the rationale in ASSIST's 2012 flicker publication, ASSIST recommends that dimmable lamps or luminaires produce a calculated acceptability rating greater than zero for frequencies equal to or greater than 100 Hz. The tradeoff between frequency and percent flicker can be simply calculated using the equations published by ASSIST. Dimming profile No limitation on the detailed shape as long as the dimming profile is monotonic and meets the dead travel and range requirements. No more than 5% of the maximum light output. No less than 90% of full light output at rated voltage (i.e., not on a dimmer). No more than 10% of dimmer travel at the top and bottom, or middle of the dimmer setting. For frequencies below 100 Hz, less than 10% flicker; for frequencies equal to or above 100 Hz, a calculated acceptability rating greater than zero, following the procedure put forward in ASSIST recommends...Flicker Parameters for Reducing Stroboscopic Effects from Solid-state Lighting Systems (2012). Audible noise is an important parameter to consider in the definition of dimmable products; however, at the time of writing, no specific measurement method or noise criterion has been established. ASSIST. 2013. ASSIST recommends...Dimming: A Technology-neutral Definition. Troy, N.Y.: Lighting Research Center. ASSIST. 2012. ASSIST recommends...Flicker Parameters for Reducing Stroboscopic Effects from Solid-state Lighting Systems. Volume 11, Issue 1. Lighting Research Center: Troy, N.Y. ASSIST. 2011. Technical Note: Dimming LED Integral Lamps. Troy, N.Y.:Lighting Research Center. ASSIST. 2011. Technical Note: Variations in Household Wall Dimmers for Lighting. Troy, N.Y.:Lighting Research Center. ASSIST. 2011. Technical Note: Repetitive Peak and Inrush Currents. Troy, N.Y.:Lighting Research Center.